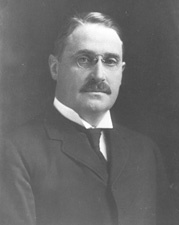 BRANDEGEE, Frank Bosworth, (son of Augustus Brandegee), a Representative and a Senator from Connecticut; born in New London, Conn., July 8, 1864; attended the common schools, and graduated from Yale College in 1885; studied law; admitted to the bar in 1888 and practiced in New London; member, State house of representatives 1888; corporation counsel of New London 1889-1893, 1894-1897, when he resigned; member, State house of representatives 1899, and served as speaker; again elected corporation counsel of New London 1901-1902, when he resigned to become a Member of Congress; chairman of the Republican State convention in 1904; elected as a Republican to the Fifty-seventh Congress to fill the vacancy caused by the death of Charles A. Russell; reelected to the Fifty-eighth and Fifty-ninth Congresses and served from November 4, 1902, until May 10, 1905, when he resigned, having been elected a United States Senator to fill the vacancy caused by the death of Orville H. Platt; reelected in 1908, 1914, and 1920, and served from May 10, 1905, until his death by suicide in Washington, D.C., October 14, 1924; served as President pro tempore during the Sixty-second Congress; chairman, Committee on Forest Reservations and Game Protection (Fifty-ninth through Sixty-first Congresses), Committee on Interoceanic Canals (Sixty-second Congress), Committee on Panama (Sixty-second Congress), Committee on Pacific Railroads (Sixty-third through Sixty-fifth Congresses), Committee on Library (Sixty-sixth and Sixty-seventh Congresses), Committee on Judiciary (Sixty-eighth Congress); interment in Cedar Grove Cemetery, New London, Conn. Dictionary of American Biography; Janick, Herbert. Senator Frank B. Brandegee and the Election of 1920. Historian 35 (May 1973): 434-51; U.S. Congress. Memorial Addresses. 68th Cong., 1st sess., 1924-1925. Washington, D.C.: Government Printing Office, 1925.